Pictures below show the small solar greenhouse and solar experimentation building. It is 20 by 10 ft (20 ft in the E-W direction) . Glazing is also 10 by 20 ft slopped at 60 degrees -- 10 mm twinwall polycarbonate. It modeled roughly after this GH, but smaller. Floor has vertical perimeter insulation down to 2 ft, and 1.5 inches of EPS will be used in the floor (not in yet). Walls and north roof are 2 by 6, and will probably be insulated with R21 fiberglass plus 1 inch polyiso rigid board inside for about R27 with some protection against thermal bridging. I am taking some pains to reduce air infiltration with careful sealing and construction adhesive. Phase 1: As a house heating sunspace. I'd like to complete the structure including insulation and sealing, and then use it to experimentally measure its heat output as if it were a sunspace attached to a house. I like the idea of using a low thermal mass sunspace to provide heat to an attached house, and would like to use this GH to validate the calculations that show that a sunspace can be an efficient and cost effective heating structure (as well as serving some additional valuable functions). That as a sunspace it can be as (or more) efficient than active solar heating collectors. One problem with this is that I don't have a good supply of room temperature are to replace the heated air that I take out of the sunspace -- any ideas on this? One possibility would be to run a large duct over to the shop to act as an inlet air source? Another problem is that I need a way to keep the direct solar coming in through the glazing from being absorbed by the floor -- some kind of cheap insulating layer I can put on the floor for this part of the testing? This is basically an extension of this Barra box experiment -- idea is to convert a part of the GH (probably the West 8 ft) into a small, livable room that maintains its temperature at "comfortable" levels just using solar heat input. I don't have any firm idea what this design should be, so any ideas would be welcome. One thing that occurred to me during the building is that if the size of the whole thing was increased a bit (maybe 12 by 24 ft?) that this would make an interesting Tiny House plus attached sunspace/greenhouse arrangement. The Tiny House could occupy the east or west end and be thermally efficient. The sunspace/greenhouse would provide the ability to be more self-sufficient by growing vegetables and it would also provide some additional sunny living space when the Tiny House feels too tiny. I guess this version would not have to be totally thermally self-sufficient with only solar heat, but could aim to have a yearly heating bill of (say) $100? The end goal will be a greenhouse that can grow things through the Montana winter. The GH as it is is based loosely on this Univ of Missouri GH which in the Missouri climate is able to grow all winter with no supplementary heat. In MT, this will probably require some additional work -- perhaps movable insulation on the glazing? Any ideas? If it sounds like I've not thought all this through in detail, that would definitely be true. By the time I decided to do the project, winter was fast approaching, so I decided to get busy building something that would probably be flexible enough to give the three phases above a try while there was still time to do the build -- as you can see from the pictures below, I just barely made it -- helped by some nice weather at the end of October. Any thoughts or suggestions on any of the phases would be appreciated -- see Comments section below. Foundation with perimeter vertical ground EPS insulation that goes down 2 ft and is 1.5 inches thick -- its 10 by 20 ft and the 20 ft side faces south. The plan is to add 1.5 inches of EPS floor insulation followed by a little pea gravel and pavers. The front knee wall -- I tried to pay attention to air sealing -- thus the construction adhesive between sill plate and foundation board. South and north walls -- both 2 by 6 with single plates. Fitting the front glazing frames. The glazed area is 20 ft wide by 10 ft high twinwall polycarb. Framed at 4 ft intervals to try to minimize the shading from framing. Another view of the framing. Applying the glazing -- five sheets of 10 mm 4 ft by 10 ft twinwall polycarb. Finished the glazing during the first snowstorm of the year. Inside -- I think that all those bright white spots are snow flakes falling in front of the camera? 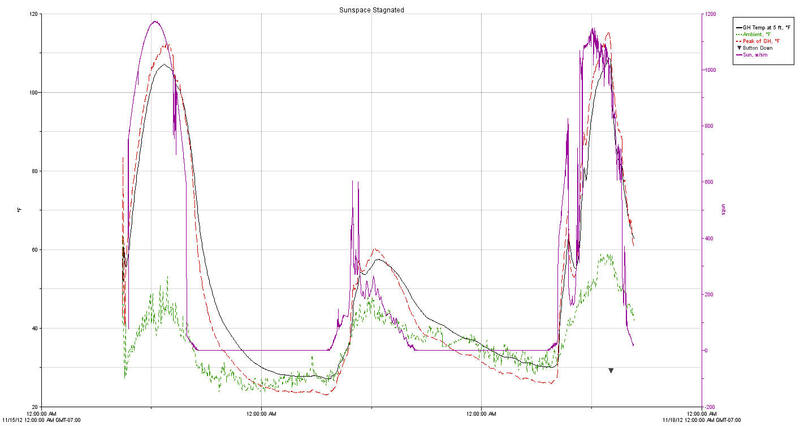 The plot below shows the GH/sunspace stagnated for its first 3 days of operationg after first being closed in. The first and last days were sunny, and the middle day was very little sun. Dirt floor -- no floor insulation other than the vertical perimeter insulation. No wall or ceiling insulation. Air heated by the GH was not removed -- it was stagnated. Red trace is a temperature sensor located near the peak of the GH. Black trace is temperature at the logger unit on west wall about 5 ft off floor. The peak temperature got up to near 120F on both of the two sunny days, and temp at 5 ft off floor was not much less. Temperatures fall fast when sun goes off the space. Sun level on middle day was low, but still produced some warming above ambient. A conventional active solar collector would never have started up on this day, but the sunspace is still able to get a little heat -- although not enough to be useful for home heating. Next step is to divide the GH into two halfs, and try to improve the collection of one of the halfs by insulating floor, walls, and ceiling. Will also add removal of heat and measurement of heat that the GH could produce for house heating. Starting to divide the GH into two halves for the sunspace testing.